A lot of commercial games claim to have a long history; there are plenty that have seen sequels and spinoffs across many different platforms. Few of them have dared to stay exactly the same throughout their lifetime. Usually there's a feature added, or a part of the gameplay changed... sometimes just minor tweaks, and other times, great sweeping changes. In the big-business world of multi-million dollar game franchises, the old adage "if it ain't broke..." got thrown out of the window (and dare I say kicked into the gutter) a very long time ago. Fortunately, indie developers don't have to conform to the "accepted" way of doing things; they aren't forced by publishers to do stuff that might ruin an otherwise good concept, so they've got every right to stick to one ideal and run with it for as long as they like. But for someone to do exactly that for nearly 20 years - yes, twenty, two zero - is a very rare and special thing indeed. 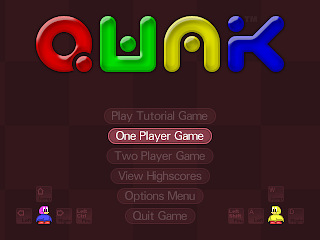 This is what Jamie Woodhouse has done with Qwak, by taking it from a BBC Micro game in 1989 to the Amiga in 1993, the Gameboy Advance in 2006 and now for the PC in 2009. Now this leads us to consider two main possibilities. Either the developer is dedicated but somewhat uninventive, and chooses to rehash the same basic formula out of convenience to keep his die-hard fans happy; or he is innovative in a way that few others are and he realises that his game was originally so close to perfection that to change it in even a small way could be disastrous. I'm not an unkind person, and nor (hopefully) am I an idiot, so I'll go with the second option every time! In one sentence, here's why: Qwak is a timelessly brilliant platformer on every level, and it'll satisfy every single retro craving you could possibly have. Easy to learn, hard to master? Check. Tons of pickups? Yup. Rewards for skillful play? Absolutely. Secret bonuses to find? You got 'em. To be honest, if I had my way, Qwak would've been this issue's featured game; that's how great I think it is. Yet despite being around for so long it doesn't seem to get mentioned enough. Before I haplessly throw around too many more superlatives, I should probably explain the actual gameplay in a bit more detail. You control one of two ducks as you dash and leap through 70 levels in a plotless quest for high scores and shiny bonus items. 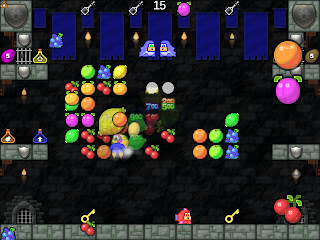 On each level, or "scene" as the game calls them, are a number of golden keys. Collecting them all will open the exit door. Too simple, you may be thinking - but no! 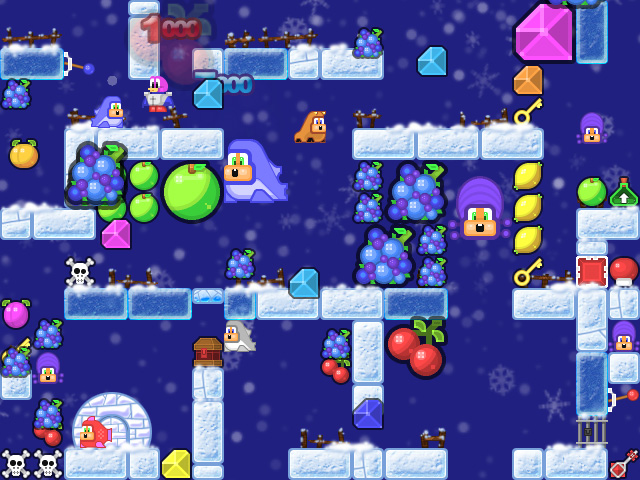 To spice things up you are encouraged to play at a jaunty pace, because lingering on a level for too long will cause a rain of spikes to descend from the top of the screen, placing your duck's continued good health in severe risk. Oh, and did you notice how I said "one of two ducks" back there? That's right - Qwak supports two players in cooperative gameplay for double the chaos and double the fun! Getting in your way are various enemies with distinct movement patterns. Just like the fruits and gems you can grab for extra points (and other rewards), each can come in normal or extra-large proportions. Although you can get rid of enemies by throwing eggs at them, you also have to worry about conserving your eggy ammunition for later levels. Luckily, the fruit that you collect is converted into eggs at the end of each screen - but the further you progress, the tougher the enemies become, and so the more eggs you'll have to use to defeat them. Some levels will give you a chance to eat up some fruits and rack up some serious points while others have a more ponderous nature, and there are even traps to work around in many later areas if you want to reach the juiciest items. The screen wraps around from top to bottom and you'll frequently have to use this to your advantage in order to dodge enemies or get to places you need to go. It can be a slightly boggling idea on your first few plays, but this subtle mechanic is a large part of Qwak's charm. 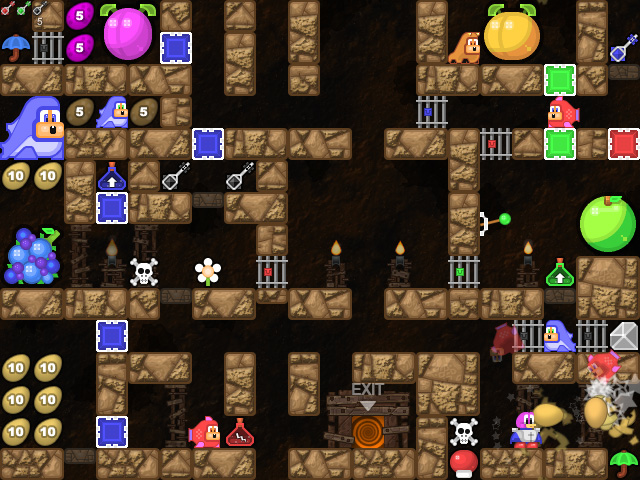 There are also bubbles to lift you up to otherwise unreachable heights and gates to block your way unless you have the correct colour key, not to mention the levers or even the mushrooms, skulls and flowers. I've already touched on Qwak's highly polished presentation, but it needs to be said again that the art, music and sound effects could hardly fit together any better. 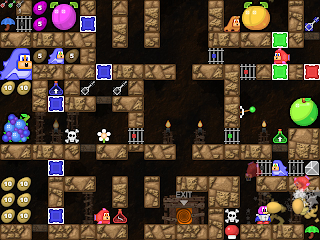 There are several graphical themes to the levels including old mines, ancient Egyptian labyrinths and crumbling castles, and while the music isn't tailored to each location it still brings back a fantastic MOD-music atmosphere. Special effects give just enough extra shine without distracting you from the action (and crivens, there's a lot of it to keep your eyes on). Comparisons could be drawn against any of several popular arcade games of the late 80s before Qwak was originally released all those years ago, but honestly, this game carves a niche all to itself and deserves to be appreciated as such. Considering that everything in the game is the work of our good Mr. Woodhouse himself, the game becomes that little bit more impressive. Please, do yourself a favour and buy this game - nothing is perfect, but this is about as close to platforming heaven as you'll get. Download the game demo here (from the official Qwak website).